This endorsement from Sarah Palin adds to the long list of nationally known conservatives and organizations who have endorsed Ted Cruz for U.S. Senator from Texas. There are many very good candidates for U.S. Senate and I have nothing against the other candidates. I just think Ted Cruz is the best. AUSTIN—Just four days before the start of early voting in the Texas Senate primary, the Ted Cruz campaign announced the endorsement of Governor Sarah Palin and her husband Todd Palin. To date, the Cruz campaign has received donations from over 19,000 individuals, from over 843 Texas cities, 225 Texas counties, and all 50 States. The average donation is under $200. 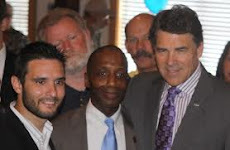 In addition, the campaign has earned endorsements from many of the top conservative leaders in Texas and nationally, including: Tea Party Express, Senator Jim DeMint, Senator Rand Paul, Dr. James Dobson, Cathie Adams, George P. Bush, Gun Owners of America, Family Research Council Action PAC, FreedomWorks, Texas Home School Coalition PAC, Kelly Shackelford, David Barton, Peggy Venable, Young Conservatives of Texas, over 200 Texas Republican women leaders, and many more. Early voting in Cass County was heavy.Ted Cruz did not get the LGBT,DallasVoice,or Log Cabin Republican endorsement.Lepper did.Google dallasvoice.com and verify.LGBT want Tommy Merritt of Longview back in Austin and Senfronia Thompson is wearing a t-shirt stating it.Wayne Christian got the most evil to LGBT along with David Simpson who is opposed by Straus Eleven Merritt.Vote early and ask ten born again Christians,constitutional conservatives and patriots to vote early.God Bless Texas,Cruz,Chisum,Wayne Christian,David Simpson,Bryan Hughes,Ralph Hall and Louis Gohmert.Respectfully;John McIntyre 1984 Reagan delegate. thanks for that good info John!